A flat in the central Eixample of Barcelona needed a totally restauration and a major structural works of most of the ceilings, walls and floors. At the same time a new distribution of kitchen, dining and living room were necessary to fulfill the requirements of the young family that acquired it. We redistribute the kitchen and the dining room, so we open up the division wall between the existing small and gloomy rooms with 3 big openings that framed the space and filter the light. The fluidity of kitchen, dining/winter-garden and living room creates a scenario for a modern family life. 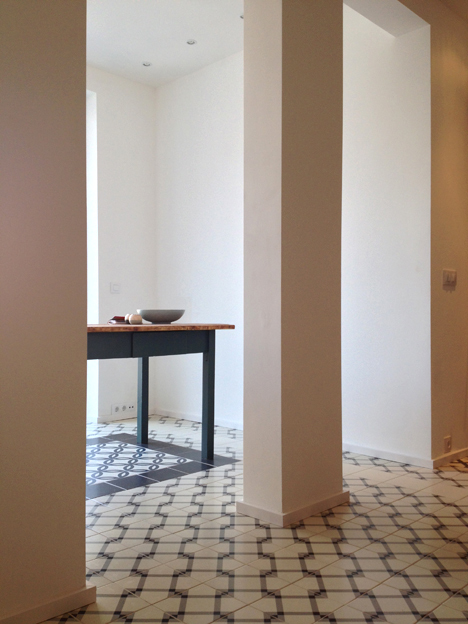 The main design concept featuring in the flat is the newly laid floor contrasting the white painted walls and ceiling. By choosing a contemporary layout of the traditional tiles, conceiving the new floors as a "macro carpet" and a fabric texture, spanning the whole lengths of the house changing patterns on its way through the different rooms.